Can I book a private game? How many paintballs will I shoot? How long does each game last and how many games will we play? Reservation System is Now Open! Click the button to Reserve your Game. $25.00 / when booking online three days in advance. $15.00 / when booking online three days in advance. * Please note that players with own gear must have effective barrel plug or barrel sock. $5 De Mayo ALL OF MAY! Want to Be a Zombie? 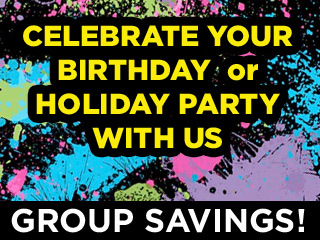 Celebrate Your Birthday Party, Holiday Party or Christmas Party with us! Save when booking a group and pay as low as $15 per person.